Correcting the rumor mongers' tales that the Kaa'ba at Mecca suddenly got infested with "black cockroaches" as a sign of upcoming "azaab." This has been going around the social media with the same zeal and madness as swirled the gossips a few years ago of Hadith rumor on so-called NASA confirmation on sun rising from West and the Hadith's NASA gossip. First off, those weren't "black cockroaches" nor roaches of any kind. 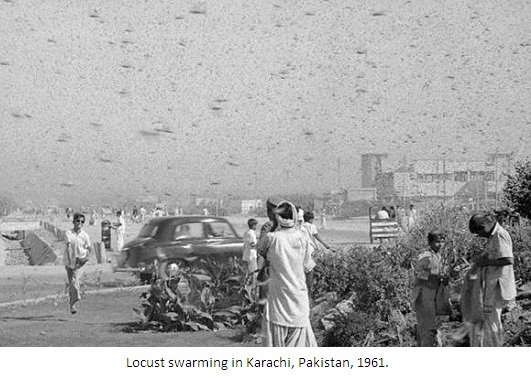 What happened was simply swarming of locusts which is a very natural phenomenon. Let's get to know what locust are. Locusts are insects resembling grasshoppers yet not exactly the same. The primary difference is in their behavioral states. While grasshoppers are solitary, that is, they only move around alone, locusts can be solitary as well as gregarious which is when swarming takes place. Locusts do not harm humans neither do they carry any diseases nor is local swarming linked to poor hygiene. Locusts do not bite nor attack humans or animals. These are simply migratory pests. The desert locust does pose a threat to agriculture, no doubt. But if the farmlands are well protected, the crops are often saved. 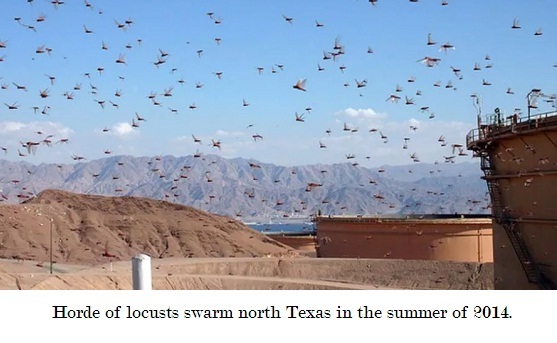 Locust infestation is a temporary natural phenomenon, lasting for a few days. There can be as many as 80 or 90 million in a swarm or more, but other than their nuisance value, they are harmless as long as the crops are protected. They love eating green plants. When or why does locust swarming takes place? When environmental conditions produce many green plants and promote breeding, locusts can congregate into dense flying swarms. When such conducive conditions occur in the oases with a lot of seasonal rain and proliferation of vegetation, locusts are attracted. Such regions are also convenient breeding spots for the insects. In the Noble Quran in Verse 3:177 of Surah Al-Araf, locusts are mentioned as one of the punishments for the community of Pharaoh in the time of Prophet Moses (pbuh). "and so We let loose on them the flood, locusts, lice, frogs, blood – all clear signs. They were arrogant, wicked people. " It's important to clarify that this Verse does not indicate locust swarming to be a punishment in every case. I repeat, it's basically a natural phenomenon and the insects are considered seasonal pests by farmers. 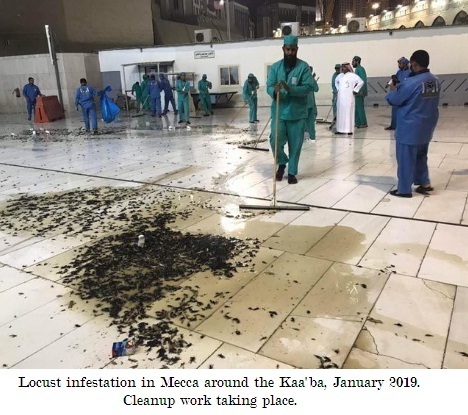 Gossip mongers in the social media and websites are exaggerating the January 2019 locust swarming in Mecca as "an azaab from Allah." Also, non-Muslims have been creating their own falsification, using the gossips of alarmists, to mock Surah Al-Fil with much nonsensical talk claiming "this time the Kaaba could not be saved" No harm was ever done to the Kaa'ba nor to any of the worshipers in the first place. I reiterate, locust swarming is completely harmless particularly in urban areas and very temporary. The people visiting the Kaa'ba during this period only faced a couple of days of inconvenience which was certainly not life-threatening nor anything even remotely harmful. All of these idiots urgently need to educate themselves. The environment ministry of Saudi Arabia announced that the swarming apparently happened in Mecca because of heavy rainfall in the Hejaz region during the winter of 2018-19. The same time the locust swarming occurred in Mecca, it also happened in Qatar. 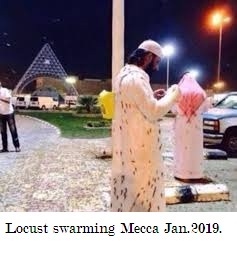 These swarms of locusts also arrived in Al-Dhafra in Abu Dhabi where the UAE air force base is located, a week after the infestation in Mecca and Qatar. 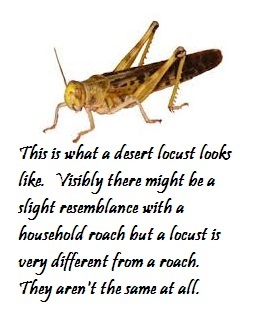 This may sound yucky: There are many places including desert regions where locusts are eaten. According to the United Nations, it's safe to consume locusts as food which, they say, is a low cost source of protein and iron. While preparing as food, locusts are usually cooked or deep fried and eaten as whole in some Bedouin communities. As we know, the Noble Quran does not mention anything about consumption of locusts as food. But according to Shariah, locust is considered Halal to eat. The Jews also eat locust, referring to it as a "kosher insect." However, eating locust sounds very unpleasant and most Muslims wouldn't opt for it by choice, unless they are starving and have nothing else to survive on. 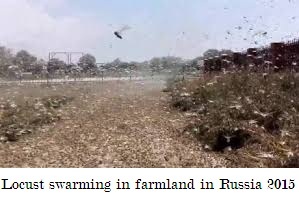 As a natural phenomenon locust swarming has taken place in many parts of the world from ancient to medieval to modern times; not an unusual occurrence particularly in farmlands around the world, often shortly prior to harvest season when crops, fruits and vegetables begin to bloom. It has happened in the USA several times. The most dense swarming in world history was in the 1870s in America in Colorado, Minnesota, Kansas, Missouri, Nebraska and few other nearby states. Back in those days farmers weren't sufficiently equipped to protect their crops and so this infestation caused crop damage worth $200 million. A farmer described the swarming as being so dense that it almost blocked the sunlight in certain farm areas. It happened in Russia in 2015, in Madagascar in 2014 and in Pakistan in 1961 to name just a few. I suppose it was looking at images like this one that rumor mongers began dubbing the locusts as "night cockroaches" or "black cockroaches." These are plainly dead locusts. They are looking darker because this is a night image and the color of insects always darken after they're sprayed with pesticides, though reportedly the least invasive pesticide was used. Karachi is Pakistan's biggest city and only seaport in the south of the country. Locusts on clothes of a worshiper in the Kaa'ba January 2019. Madagascar. For information, Madagascar is an island and part of Africa in the Indian Ocean off the southeast coast of Africa. 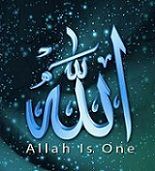 Mocking Surah Al-Fil based on hadithist gossip was spread by a troll Islamophobe in certain web pages, sometimes using the id "ex-Muslim" and sometimes "christian prince." And after spreading their false gossip, since the Hadithists never corrected themselves that this was simply locust swarming, hence they never stepped forward to correct this 'christian-prince' bugger either. "It's a sign of azaab ....."
Tell her that people like herself are the real "azaab" along with the Islamophobes .. much greater azaab than the locusts. I'm sure he is no "ex-Muslim." He never was a Muslim so no question being "ex-Muslim." These members of hezb-e-shaitaan try to show that many Muslims are quitting Islam. It's the sort of jealousy they vent on learning of Islam to be the fastest growing Faith in the world. And right Sister Ruhi, these trolls along with the hadithers are the real azaab. Yeah Sis, my husband mentioned the same. Non-Muslim Islamophobes trolling and posing as Islam-quitting Muslims is becoming a widespread online drama. IDs like ex-Muslim, former Muslim, past Muslim, no more Muslim etc. are very common false user names these mischief mongers go for. None of them were ever Muslims in the past. Wa'Salam. Much needed clarification. Thanks sister. This very periodical natural phenomena masked as "azaab" by hadithists went around for several days similar to the distortion of NASA story, much to the delight of Islamophobes.